﻿ Long term update: How hard can it be to film Mad Max footage? Having got Christmas out of the way and the decorations back in the loft, I finally had five minutes to play with my new presents. Like a lot of riders, one of my gifts was an action camera – the TomTom Bandit (£299.99), perfect for making a short video featuring my pride and joy: the Honda Crossrunner. After a bit of reading up on the ‘how to’ side of things and downloading the TomTom Bandit app onto my iPhone I felt ready to have a go. I wanted to get a bit of a different film angle on things, and one of my old favourite action motorcycle movies sprung to mind, Mad Max where they filmed the rear of a Kawasaki Z1 from almost ground level. Now how could I copy that? With my post-apocolyptic inspiration in mind I set about working out the angles. One of the really nice touches with the TomTom Bandit is that it can connect wirelessly to my iPhone so I can see exactly what the camera is capturing. After a bit of fiddling around I found the perfect position for the camera, and all I needed to do was to make a frame to hold it there. The rack on the rear of the Crossrunner seemed the place to start, and I was going to make the Mk1 mount out of some wood I had to hand, as it could be easily modified if necessary. With basic woodwork skills, some cable ties and a bit of ingenuity, I was ready. My mount would not be the most sylphlike of structures, but it worked. To capture the action I rode one of my favourite undulating and winding roads in both directions three times, changing the camera mounting point each time to capture three different angles of the same road. These would then be stitched together seamlessly when I got back to my computer (hopefully). I’ve had a look at my results and I am chuffed at the first attempt. The camera works brilliantly and is so easy to operate, showing the ground rush and suspension working away. I just need to stop the camera mount from springing around. Maybe a Mk2 mount made from metal could do the trick. 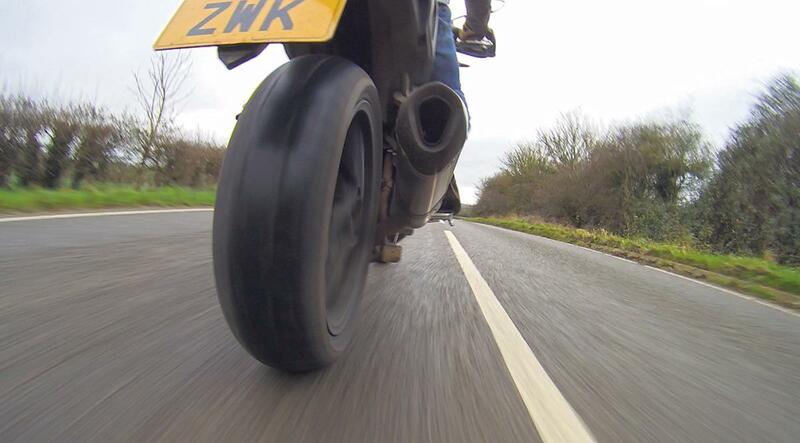 More footage with the camera mounted to my crash helmet and the side of the bike was much more stable.